Tag Archive | "The Zebra Danio (Danio rerio) or Zebrafish"
The Zebra Danio (Danio rerio) or Zebrafish s a tropical freshwater fish belonging to the minnow family (Cyprinidae) of the order Cypriniformesi. They are popular with tropical fish keeping enthusiasts as well as scientific researchers who frequently use them in genetic experiments. Zebra Danios originated from the Ganges region of eastern India. They are native to the Himalayan region and inhabit the streams, canals, ponds, ditches, rice fields and slow to faster moving streams of eastern India, Bangladesh, Pakistan, Burma and Nepal. Zebra Danios have also been introduced into parts of the United States either by escape from fish farms or deliberately. The Zebra Danio is easily recognized by it’s striped zebra pattern. Their body color ranges from silver to gold with five uniform horizontal blue to purple stripes that stretch from the gills to the end of their tails. Being a shoal fish, Zebra Danios are extremely active swimmers especially when housed with others of their kind in small schools. In the aquarium, they prefer a densely planted tank with a lot of area for them to swim around in. They do best when housed with other non aggressive members of the Cyprinidae family. Female Zebra Danios generally have larger bellies than the males, but both are distinctly torpedo shaped. Male Zebra Danios will normally spawn with one female and remain loyal to that particular fish. When a breeding pair is placed in an aquarium with a spawning mop or fine leaved plants for them to spawn over, they will usually drop 300-400 eggs which will hatch within a two day period. Remove the breeding pair immediately after the eggs are laid to minimize losses. The adults seem to relish eating their own eggs. After they hatch, the fry can be fed finely crushed flake food and small pieces of live food, such as brine shrimp or daphnia. Adult Zebra Danios should be fed a varied diet of quality flake and frozen foods. 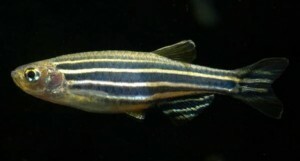 Zebrafish are usually 1″ to 1-1/2″ long when available for purchase.